Okay, I admit it. I used to drink Muscle Milk. You know, those ready-to-drink shakes advertising 20 grams of protein, vitamins and minerals? Yeah, they have protein, and yeah, they have some added nutrients, but are they 100% healthy? No, they are artificially flavored and contain quite a bit of that fake sugar, sucralose. So I made a healthy replacement! 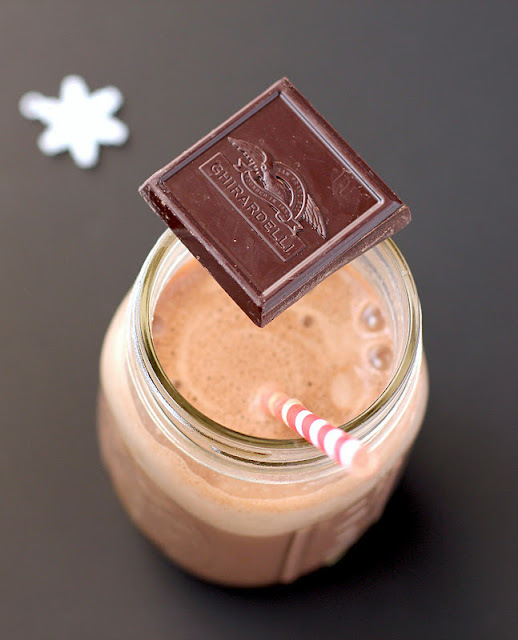 And did I mention that this Healthy Chocolate Muscle Milk is 100% good-for-you? A thick and creamy shake that is… wait, what did you say? LOW CARB?!? Yup! 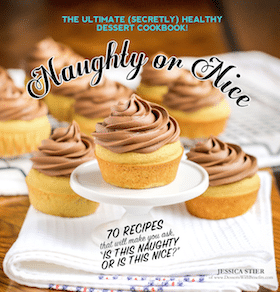 For the first time on Desserts With Benefits, a low carb recipe. 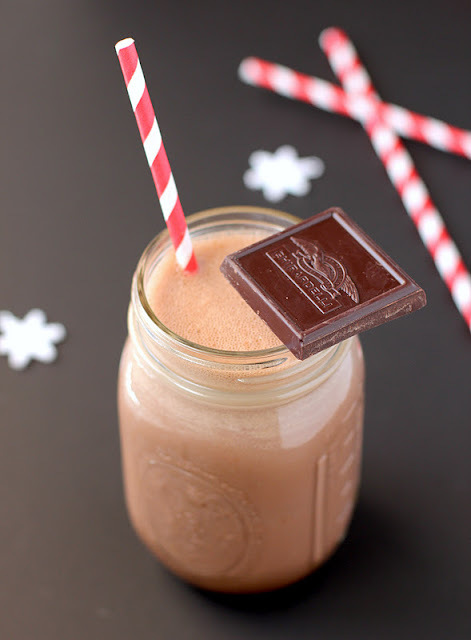 So you can drink this luscious chocolate drink and not have to worry about added sugars (or fake sugars). Is it just me, or is that a bite of delicious chocolate staring you down? And how lovely, it’s within arms reach… from ME! 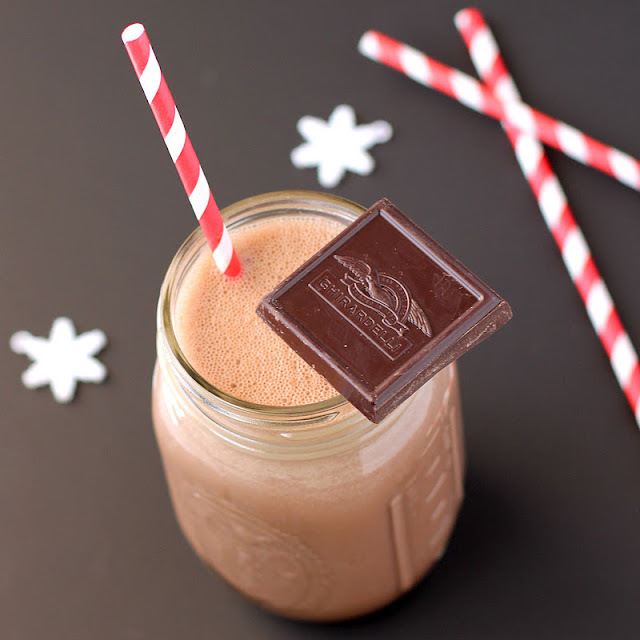 This 5-ingredient Healthy homemade Chocolate Muscle Milk can be made in just a few minutes flat! Unlike the store-bought kind, which has a whopping 40 ingredients on their label! 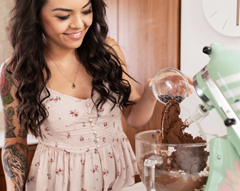 Add all of the ingredients to a blender and puree until completely smooth. So drink this shake and flex those muscles! Hey! Cool idea! Vegan Muscle Milk will work so well for me! What’s also really cool is your nutrition facts! Where did you get them?! How did you do that?! Just wanted to let you know that the protein powder you are using is not vegan. Whey is a dairy by product. You make want to make a note on the recipe since you are categorizing it as “vegan.” It’s confusing. Great recipe though! Did she say it was vegan? I didn’t think so. My problem with this recipe is the soy milk. Soy is not good for males. love this! so nice to see a smoothie with no bananas too! I realized I forgot to put an asterisk (*) next to the protein powder to make vegan an option. You can use whatever protein powder you like, vegan or not. Love your simple, clean, delectable looking photos. Also, it’s always so helpful when you supply the nutritional chart for your stuff too. I absolutely love your blog. I just read it entirely after finding this recipe on tastespotting. I would love to be able to talk to you about how to switch over to eating the way you do. Just turning 25 last week, october 6th is my birthday too!, i realize that I must change the way I eat. I have already been a foodie for life (i watched the food network as a child not cartoons) and in the last semester of college a year and a half ago, an active pursuer to eat better. I have watched all the documentaries about the commercialized food industries and how corn (even though i love it in it’s vegetable form) has over taken the shelves. I am repulsed by processed foods however I still find myself slipping towards them. Your blog has energized me to actually “practice what I preach”. As for processed foods, when you find yourself in the aisles of the grocery store, don’t think about how good the item tastes, think about the food in its deconstructed form–look at it as a pile of ingredients rather than the actual food and just think, do you still want it? After researching about partially hydrogenated oils/trans fats, I realized that big companies don’t really care about their customers’ health, and they will put whatever ingredient that is cheapest in it to make it last longer. All they want is money for themselves. When I look at a Snickers bar (a great weakness of mine in the past), I just see a greedy business who wants my money, and I will not give them any to further produce their product. Although we are different people in different situations, I hope we can all strive for the same thing: a healthy, whole life that is accompanied by foods that nourish us in every way, body, mind and soul. I appreciate the time you spend here, and thank you so much for your inspiration, Brittany! 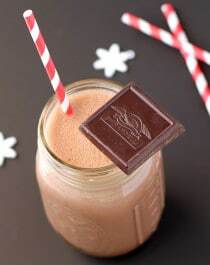 Chocolate milk shake is my one the first choice among all milk shake which is too much tasteful compare to other milk shake items…Thanks for sharing..
is there a substitute i could use for the protein powder? 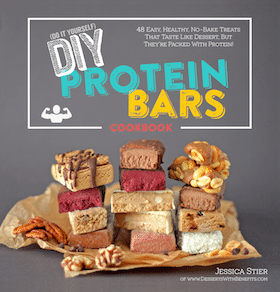 i don’t use protein powder but your recipes look delicious, and i would like to make them if i can! I’m crossing my fingers this works, good luck! I LOVE LOVE LOVE the multitude of pictures you took of the EXACT SAME SCENE that probably took you five minutes to set up with all the auxiliary straws and snowflakes and PERFECTLY BALANCED CHOCOLATE SQUARE. Its so DAMN CUTE that I think I’ll GO PUKE NOW. Ok i’m done, thanks for the recipes! This looks great! Where does one buy xanthan gum? Can I find it at a regular grocery store? If so, what would it be located by? Thanks! You can buy it online or in stores. It’s a large package so it will last you forever! Can I use almond milk instead of soy milk and chocolate flavored rice protein (sun warrior) instead of whey protein? So, I tried this recipe twice, making several adjustments for health and nutrition purposes. First time I used almond and hemp milk as each offer varying vitamins and minerals and a good amount of protein without the worrisome GMOs or hormone disruptors that is typically associated with soy. I once again tried stevia, even though I have not liked it in the past. I didn’t like it this time either. But, instead of using the Xanthan gum I used chia to thicken the shake. It worked perfectly (and again – supercedes the Xgum in nutritional value. The second time I made it I cut back on the stevia and used my favorite natural sweetener…dates. Dates have amazing nutritional benefits including fiber. It was MUCH tastier. Superb work, I am carving chocolate muscle milk, right now I can smell the cholate. Good work. and also Pic of chocolate muscle milk looks so delicious. I followed the recipe, but it turned out really powdery even after blending it. I added an extra cup or so of milk to try and balance it out, but it still has a very gritty texture like it didn’t mix completely. Any thoughts to resolve this? Hmmm that’s really weird. I’ve never had that issue using whey protein (which dissolves the smoothest out of all protein powders). Did you use a different type of protein (like brown rice protein powder, or a vegan protein powder which tend to all be gritty) or make any ingredient substitutions? That seems like the only reason this could ever be gritty.